"There are plenty of ways to enjoy salmon...this is a simple, quick and easy recipe that tastes great everytime! small dash of Jane's Crazy Salt or Morton's "No Salt"
Pre-heat charcoal grill or if using an oven, pre-heat to 450 degrees. 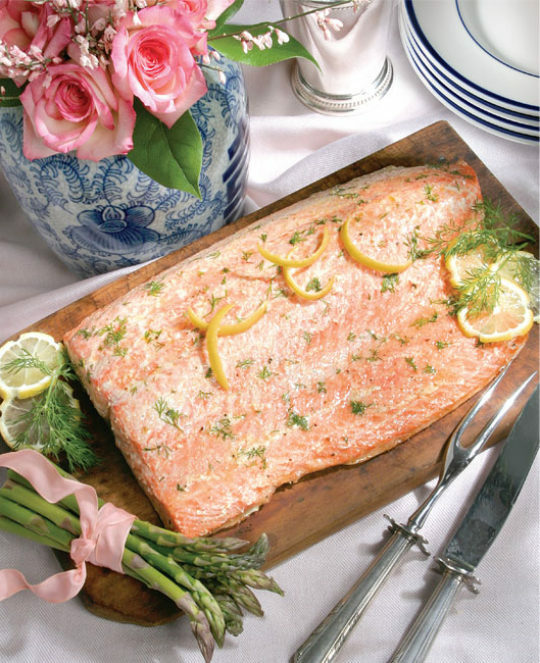 Lay flat a length of Heavy Duty Aluminum Foil, long enough to extend 5 inches beyond each end of the salmon fillet. Form a "pan" by rolling up all 4 sides of the foil to make the sides of the "pan". Spraying the foil with a non-stick spray will make it easier to slice and serve. Sprinkle the salmon with dill, garlic powder, and very lightly with seasoned salt or salt substitute. Spread 1 Tbsp fat-free mayo to keep salmon moist while cooking at these high temps. If you have fresh lovage, lay it across the salmon. If using the oven, cooking time is approx. 15 to 17 minutes, depending on thickness of fish. Before cutting and serving the salmon, remove the lovage, if using.